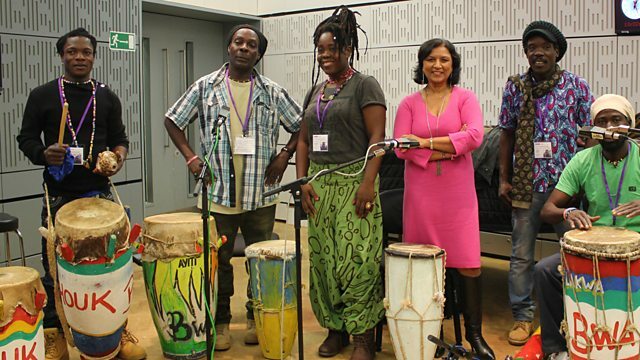 Lopa Kothari presents Haitian roots music from Chouk Bwa Libete in session plus new tracks from across the globe. Lopa Kothari with new tracks from across the globe and a specially recorded studio session from Chouk Bwa Libète, a percussion-driven Haitian roots band led by vocalist and composer Jean Claude 'Sambaton' Dorvil and featuring master drummers from the Vodou communities of Gonaives. Plus new releases from Seun Kuti, Baloji, 3hattrio and Gitkin. Your Queen is a Reptile. Camarão - The Imaginary Soundtrack to a Brazilian Western Movie 1964-1974. Live at the Union Chapel.